In our recent blog post Succession Planning: The Problem and a RoadMap, we concluded with a RoadMap for how to establish a framework for an approach to succession planning. 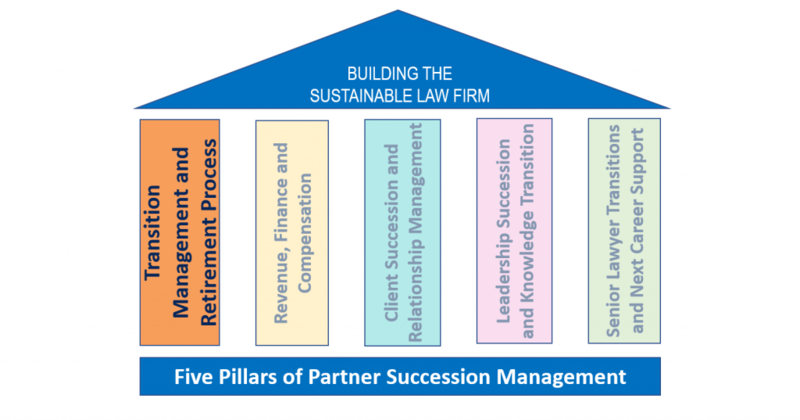 This post provides additional detail about five components that comprise the pillars of succession management. Retirement age guidelines/policies, for example, when every partner turns 55 or 60, the managing partner meets with individuals to talk about their plans for the later stage of their careers, both at the firm and elsewhere. Identify mutual goals and expectations. For every partner 60 or older, the managing partner (or department chair) should explore each partner’s expectations regarding annual compensation, client transition credit, capital paybacks, whether they expect a “tail”, etc. This dialogue helps prevent misunderstandings and should encourage more productive transitions. Annual partner business plans/timelines. Firms that require annual business/practice plans for partners have an easier time with the onset of client and practice transition discussion. In some firms, by age 55, 57 or certainly by age 60, they add a modified set of questions that must be answered concerning clients, identified successors, progress made on transitions, practice expertise gaps and transitions, etc. Phase down options. Different partners will want or need different timetables for phasing out of the practice or the firm. In some firms, partners are invited to stay as long as they want and are provided an office. In other firms, partners 65 and older must request an annual extension of their transition out of equity partnership to be reviewed and approved each year by the management committee. Internal and external communications. Succession, retirement and client relationship transitions should become a natural sequence in a firm’s talent and client lifecycle. Clients want transparency and clear communication about how and by whom their needs will be met in the future. The firm should also promote honest and open communication internally, assuming senor partners have agreed to the timeline of transition. In 2016-18, we conducted workshops for various chapters of the Association for Legal Administrators on succession planning. During break-out sessions, participants brainstormed to develop proposed solutions to the challenges posed. We included a couple of these below. Problem/Challenge 1: Your firm doesn’t have a formal succession process in place; everything is done ad hoc. How can you convince management to develop a succession plan and of the attendant risks if the firm does nothing? Problem/Challenge 2: Many senior partners say they want to work until they are “carried out on a stretcher.” Should this be addressed and if so, how can this be addressed? Encourage and identify new roles in the firm – one firm has a program called “Phase 4” where they appoint senior partners to important internal roles like mentoring, knowledge capture, etc. Provide individual financial planning to alleviate fear about income – one firm has been doing monthly lunches with benefits consultant available to counsel lawyers and others on retirement saving, etc. Our next blog post will focus on Pillar 2: Revenue, Finance and Compensation aspects of succession management.